Madagascar Circus is rated 3.7 out of 5 by 6. Rated 5 out of 5 by meme2222 from Don't be fooled by the demo, levels get challenging When you try the demo don't think that all levels will be as easy. This game has 300 levels. In an hour you don't make it past the USA which is the only very easy levels, therefore you may be led to believe that this will be just for children. No, it is for adults too and will offer you the challenge you seek. USA levels can be a good starter and teaching game for children wanting to learn match 3 games, so if you are thinking of getting for your children it will still be a good family game and they can play the first 20 levels. France levels you will start needing to buy power ups to complete levels so for a little more experienced player. 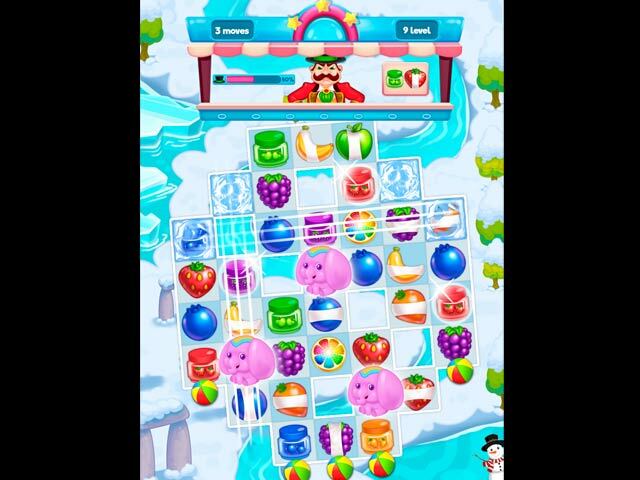 As you progress you will get things like candy chains, needing to make cotton candy, growing strawberries, making matches next to drums to collect, bringing down animals off the board and beating bosses at end of each level by decreasing his meter with specific tokens matched. And this is only by 3rd country. This is level of my review, 3rd country, Great Brittan and I have to play levels over a few times managing my power ups and trying to get 3 stars. The quantity of stars you get can earn you additional coins by letting you open the presents placed on the level board. 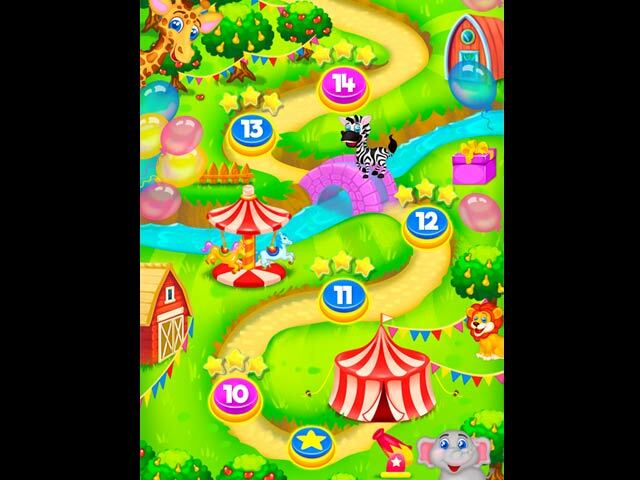 Level board lets you select any level for replay and also by clicking circus tent to go back to previous countries. As far as all the other challenges in this game I am sure it will not disappoint. Each country has about 20 levels and trying to beat them with 3 stars you may need to play over a few times but if you just want to get through them it is not too difficult for the relaxing gamer if they are satisfied with one star. Each level you complete you will earn coins based on how many stars which is a second incentive to get more stars. All coins won help purchase power ups. This is a move based game, no timer. It doesn't allow you to make multiple matches before tokens finish falling but it doesn't interfere with pace of game. The exploding power ups are fun to generate and you get good cascades. It is nice to get a game that is new in every way and offers a different variety of gameplay instead of purchasing series of a game that will give you the exact same game with nothing but a different title. Yeah, I like Mystika, Lauraville and Jewel Match but their series are repeats. This is a new refreshing game and I am so glad I purchased. Looking forward to continue my journey and see what other new delights are in store in Brazil, Spain, Germany, Italy, Canada, Japan, Austria, Argentina, Russia, Norway, Netherlands and Australia. A long game well worth the money. Rated 5 out of 5 by raydog from Love the little critters! I thought this was a kids game but I am up to levels in the 50s and it is tough! The easy levels pull you in and I had over 600 coins but as the levels get harder you must buy power-ups to get through them. It is challenging - just give it a chance. I love throwing fruit at the bad guy too. Big animal lover here! At his point I only have 11 coins left - not enough to buy anymore power ups. Will have to redo levels again. Great game - by the way, the colors are really pretty too! Rated 4 out of 5 by moonladydi from Great for kids Based on the Demo... Bright, colourful, and large, easy to see fruit tiles. Very easy, slow paced Match 3, suitable for children, or those wanting a simple, relaxing game to kill a dull afternoon. Plenty of bonus items, bombs, etc. to earn if needed. The levels do get harder as you progress. Only negative was that you can't turn off the tutorial. 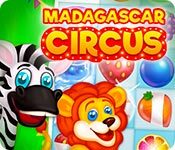 Rated 3 out of 5 by pennmom36 from A FIVE STAR GAME FOR KIDS Madagascar Circus is a really cute game and it's definitely a great Match 3 game for kids, or adults who want an easy, relaxing time killer. Unfortunately for me personally this game has too many features that I hate in a Match 3 game. This is a Limited Moves Swap type Match 3 (I hate limited moves) You cannot make matches quickly because you have to wait until all tiles finish falling before making the next match (I don't have enough patience for this) It takes forever between levels, because the game keeps playing after you've met all goals, as it plays through unused bonuses and unused moves. (did I mention I don't have patience for this?) And the Tutorial is practically worthless, in fact, the Zebra didn't explain about the bonuses and their uses until around the 10th level! I played the entire demo and I still don't know what happens when I open all of the boxes! If not for the above mentioned flaws, I think I would have loved this game, the circus music is familiar and catchy, the zoo animals are well drawn and very cute, and it has a ton of exciting obstacles, I loved making matches next to the hats to "pull the rabbit" out of the hat, and making matches next to drums to collect them for the elephant. 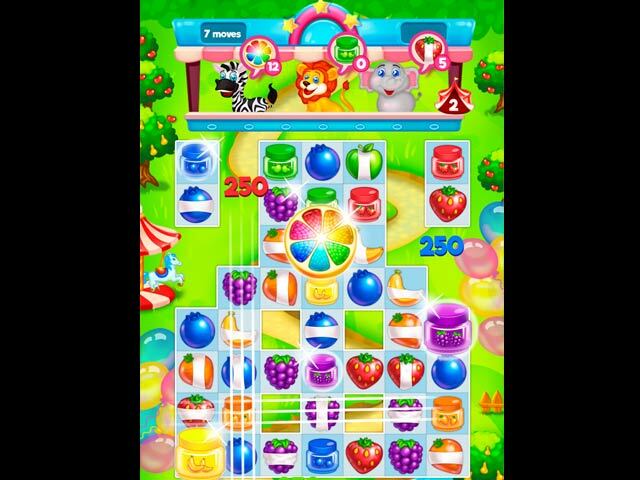 Each level requires you to collect specific amounts of fruit that is shown next to each animal. You may also need to make matches on top Balloon tiles to collect them for the Clown. Before you begin each level, you can buy the Boosters you want to be available such as Column and Row busters, Additional Moves, or Magic Fruit to clear all of the same tiles. When you make large matches you will earn boosters on the board to help you clear the tiles. There are also Power-ups that are at the bottom of the screen you can activate. The Hammer destroys 1 tile of your choice, the Cannon clears a row and column, the Shuffle scrambles all tiles on the board, and the Fruit Swap allows you to swap two adjacent fruits to help you set up a match. The Obstacles are different than most Match 3 games, but the end result is still the same. There are Blocked tiles that require adjacent tiles to bust them, Drums require adjacent matches to collect them, matches next to Hats pulls the rabbit out (some but not all have rabbits) and my favorite is the Candy Necklace that locks tiles inside requiring matches made with whatever tile is under the candy. The Circus goes to the United States first, followed by France and Great Britain, with 20 levels per country. There are several Boxes to open that require a certain amount of stars to open, the problem is, I have no idea what happens, there's no explanation, and nothing changes that I know of. I thought perhaps, this is where the animals are kept that you're supposed to free (and supposedly invite them to join the circus? Does this even remotely make sense to you, because an animal in the circus is anything BUT free!?!) however, when I go into the section with the monkey icon, of freed animals, none appear. There's a Tiger, White Horse, Bear, Monkey, Cat, Dog, Deer, Fox, Cow, Parrot, Lynx, Penguin, Duck, Koala and a Unicorn (how come I never saw unicorns at the circus?) all that need to be freed, but from where I have no clue, unless it's a glitch. I highly recommend this game for the kiddies, or for someone who doesn't mind a really easy Limited Moves Match 3 game. For me personally, I enjoyed playing the demo, but it isn't a game I would consider owning. Rated 2 out of 5 by dgeehring from For first or second graders - maybe I guess I should have known by the illustration that this was a game for little kids, but it was so deadly boring that I really don't even think they would find it that fun. It basically plays itself giving way too many extra points and helps. I have to admit I only played 17 minutes but that was more than enough!